Last weekend I went for a long run up in a beautiful canyon here in Utah. Although it is still August I was amazed at all the fall colors I saw up there. Those fall colors, and the long run made me crave something sweet. I decided to take my mom's famous roll recipe and make it with a twist. Did you know that you can replace butter in baking with pumpkin puree? If a recipe calls for 1 cup of butter simply change that to 1/3 cup pumpkin puree and 2/3 cup butter instead. Those ratios work for any baking recipe. 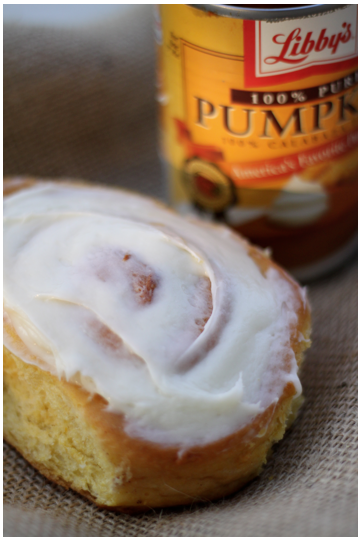 Here is my mom's AMAZING roll recipe that I have adapted with a little fall deliciousness. Add ingredients from the small bowl. Make before bed and let rise on the counter over night in a large bowl. Make sure to cover. In the morning punch down and roll flat. Melt 1/2 a stick of butter and brush onto the rolled out dough. Sprinkle with sugar, cinnamon and a tiny bit of nutmeg. Roll up the dough into a tube/log and cut into small rolls. Place each roll onto a greased cookie sheet, or even casserole dish. Bake @ 350 for about 10-12 min or until golden brown. Let cool and make this AMAZING cream cheese frosting I found HERE. These look amazing. I'm a huge fan of pumpkin!